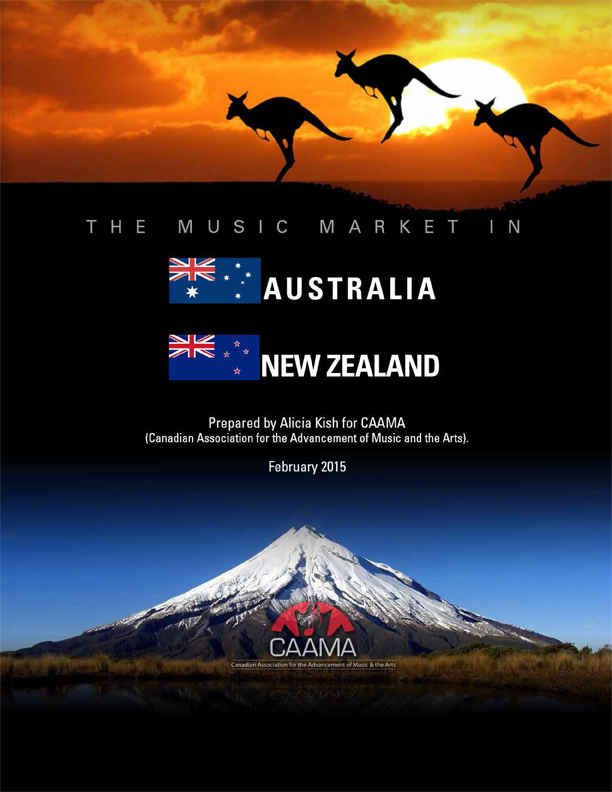 To complement the 2015 Spotlight on Australia previously announced, CAAMA (Canadian Association for the Advancement of Music and the Arts) is pleased to present an expansion to the initiative to include a Focus on New Zealand at Canadian Music Week 2015 (May 1-10, 2015 in Toronto). A part of CMW's International Buyer's Program, the 2015 Focus on New Zealand will bring key buyers, market experts and industry reps from various sectors together with the Canadian music industry in Toronto during the event's conference schedule, May 6-9. With the support of the Department of Foreign Affairs, Trade and Development Canada, delegates from New Zealand will participate in export market training sessions and share their expertise and insights while opening new trade routes for business investment and revenue potential for all in attendance. Now in its 33rd year, Canadian Music Week is one of the world's most important and longest running international music business destinations, as well as one of the biggest new music festivals in Canada showcasing global talent. Attracting thousands of delegates from more than 30 countries each year, the event serves as a convergence point for international networking, business to business transactions, structured one-on-one meetings, and specialized export programming. 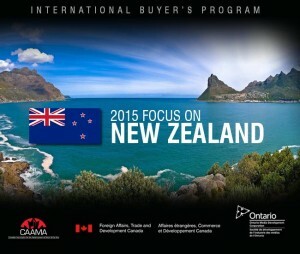 New Zealand is a major player in the Australasian region and an important like-minded partner for Canada. Powered by a market economy, New Zealand depends greatly on international trade. Free-market reforms have removed many barriers to foreign investment, making it one of the most business-friendly countries in the world. New Zealand's extensive bilateral relations with Canada combined with the country's close relations and proximity to Australia, multiplies the number of opportunities available to Canadian artists, labels and SMEs. Music radio broadcasting and live music are the two main economic drivers of the New Zealand music industry, accounting for more than $300m. The country's digital retail sector has grown significantly over the last three years and now makes up almost half (49.7%) of total retail gross output. Online consumption channels for music - from digital retail services such as iTunes or Amplifier and on-demand services such as Spotify to mobile music downloads and other services - have given labels and musicians solutions to monetising digital music, as well as more and better platforms to reach new audiences. Recognized for earlier contributions to pop music made by Kiwi musicians Split Enz, Crowded House, and OMC, New Zealand has gained prominence in the last few years with the chart-topping success of Lorde as well as breakthroughs by Kimbra, The Naked and Famous, and Broods. This strong investment in music, supported by a healthy market for music festivals of various sizes catering to a wide range of musical tastes, makes New Zealand an alluring territory for discovery. From humble beginnings some thirteen years ago in a single-car garage hidden deep in the suburbs of East Auckland, New Zealand, Rhythmethod has grown into New Zealand’s largest and most successful independent distributor. Managing Director and Owner Peter Baker, with his twenty-odd... read moreFrom humble beginnings some thirteen years ago in a single-car garage hidden deep in the suburbs of East Auckland, New Zealand, Rhythmethod has grown into New Zealand’s largest and most successful independent distributor. Managing Director and Owner Peter Baker, with his twenty-odd years experience in music retail both in New Zealand and in London, a senior role at iconic importer Flying In and five years growing the roster as Sales Manager at Border Music, Pete has a firm knowledge and understanding of NZ retail, is well respected and has great relationships with customers, suppliers and artists. Peter finds the most exciting and rewarding aspects of being a distributor is dealing with local musicians and helping them realise their goals and dreams – through a firm focus on sales and strong promotional support. From multi-platinum selling acts like The Black Seeds, Fat Freddy’s Drop, Shapeshifter, Tiki and Flight Of The Conchords. Fat Freddys Drop debut album “Based On A True Story” has sold over 140,000 copies, currently 9 times Platinum and has the honour of being New Zealand’s highest selling Independent local release. Rhythmethod also deal with noted international labels include the Beggars Group (home to XL, 4AD, Matador and Beggars), Sub Pop, Tru Thoughts, Soundway, Revolver (U.S.) and Drag City – alongside Australian partner Inertia with whom they work closely on a large number of licensed releases. Adele’s 21 is currently New Zealand’s longest chart topping release, with sales sitting at 190,000 plus. Peter was appointed as the RIANZ Independent Delegate in 2010 and is on the committee for the NZ Music Awards for his fourth year. Dean Cameron is the distribution & member services manager for Recorded Music NZ. Recorded Music NZ is a non-profit industry representation and licensing organisation for recording artists and their labels. Its activities include public performance, digital & broadcast licensing of... read moreDean Cameron is the distribution & member services manager for Recorded Music NZ. Recorded Music NZ is a non-profit industry representation and licensing organisation for recording artists and their labels. Its activities include public performance, digital & broadcast licensing of sound recordings including a joint venture OneMusic with the author’s society APRA, the Vodafone NZ Music Awards, the weekly Official NZ Top40 Charts, Music Grants programme & ProMusic division which advocates on behalf of recording artists & labels across the New Zealand recording industry as well as providing information & resources for music fans. Gary Fortune has been managing the New Zealand Music Commission’s export program Outward Sound since it’s inception in 2005. The New Zealand Commission is a Government-funded agency committed to growing the NZ music business. Outward Sound office undertakes projects and partnerships... read moreGary Fortune has been managing the New Zealand Music Commission’s export program Outward Sound since it’s inception in 2005. The New Zealand Commission is a Government-funded agency committed to growing the NZ music business. Outward Sound office undertakes projects and partnerships aimed at exporting NZ music and assisting music businesses in working internationally. Ben Howe is managing director for two of New Zealand’s best-known labels, Arch Hill Records and Flying Nun Records. He started out with music in the 1990s on bass with Flying Nun band Superette and later that decade established the NZ label Arch Hill. Artists on that label include icons such as... read moreBen Howe is managing director for two of New Zealand’s best-known labels, Arch Hill Records and Flying Nun Records. He started out with music in the 1990s on bass with Flying Nun band Superette and later that decade established the NZ label Arch Hill. Artists on that label include icons such as David Kilgour, The Clean, The Bats, Bailter Space and new artists such as Street Chant, Surf City, Ghost Wave, Transistors and others. More recently Ben has taken over at Flying Nun Records, who have just set up a New York office and started reissuing vinyl albums from the label’s 30 year catalog. These include The Clean, Snapper, The Bats…and more to come. Ben has also been a partner in touring company Mystery Girl Presents and St Jerome’s Laneway Festival NZ. Teresa Patterson is a partner in CRS Music Management in New Zealand, a full service management company who’s clients include The Naked and Famous, Brooke Fraser, I Am Giant, Breaks Co-op and PleasePlease. CRS Music Management also have a touring arm that for the 10 years have been the local... read moreTeresa Patterson is a partner in CRS Music Management in New Zealand, a full service management company who’s clients include The Naked and Famous, Brooke Fraser, I Am Giant, Breaks Co-op and PleasePlease. CRS Music Management also have a touring arm that for the 10 years have been the local promoters for The Big Day Out and have toured in NZ – FUN, My Chemical Romance, Snoop Dogg, Crystal Castles, Pretty Lights, Alabama Shakes, Odd Future amongst others. Teresa started in the Music Industry 20 years ago – first at Polygram Records for 5 years (now Universal) in sales, then promo and marketing and then at Virgin Records for 5 years as Marketing/Label Manager. IMNZ is the trade association for New Zealand independent labels and a member of WIN, the Worldwide Independent Network. IMNZ produces the annual Taite Music Prize and the Going Global NZ conference. IMNZ has proudly provided assistance and music services to its members for 12 years. Dylan... read moreIMNZ is the trade association for New Zealand independent labels and a member of WIN, the Worldwide Independent Network. IMNZ produces the annual Taite Music Prize and the Going Global NZ conference. IMNZ has proudly provided assistance and music services to its members for 12 years. Damian Vaughan is the Chief Executive of Recorded Music NZ. He has many years’ experience in music licensing with lengthy stints at APRA AMCOS in NZ and PRS For Music in the UK. Adding to his strong music licensing background, Damian has been Business Development Manager for Independent Music New... read moreDamian Vaughan is the Chief Executive of Recorded Music NZ. He has many years’ experience in music licensing with lengthy stints at APRA AMCOS in NZ and PRS For Music in the UK. Adding to his strong music licensing background, Damian has been Business Development Manager for Independent Music New Zealand and has also worked for Kog Transmissions, a leading independent label in NZ.